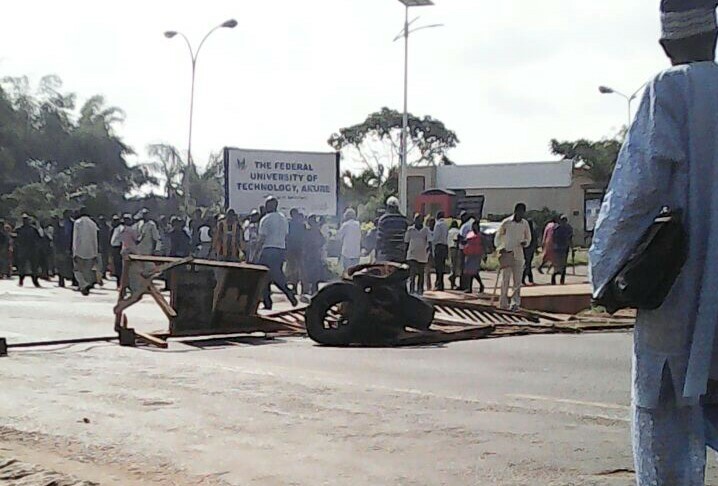 Update on the accident story involving the Futa VC and a Staff yesterday. 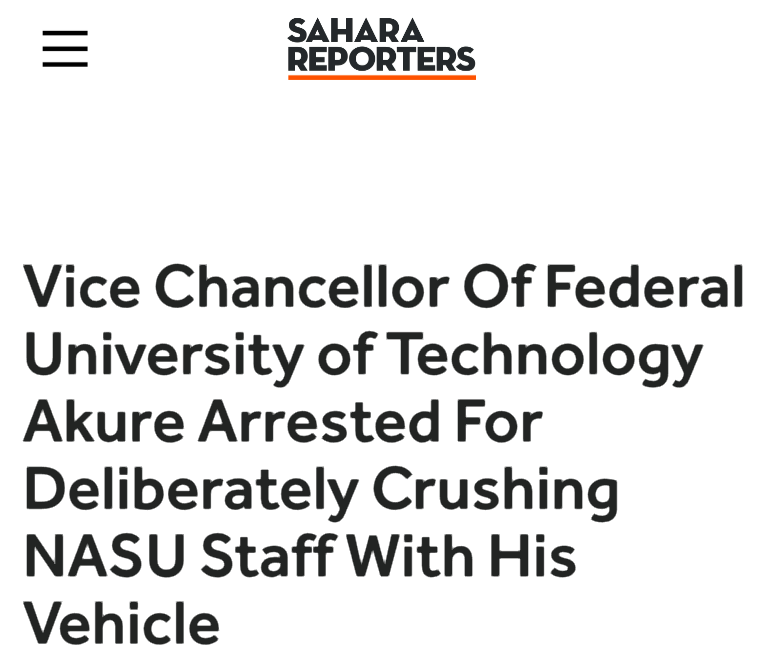 It's no new gist that an accident occurred in futa yesterday involving the driver of the VC, Federal University of Technology Akure and a Staff yesterday... like I wrote earlier which a post by Sahara reporters debunked, the staff who was the accident victims didn't die but hospitalised neither was the VC arrested but only escorted by the police for his safety. 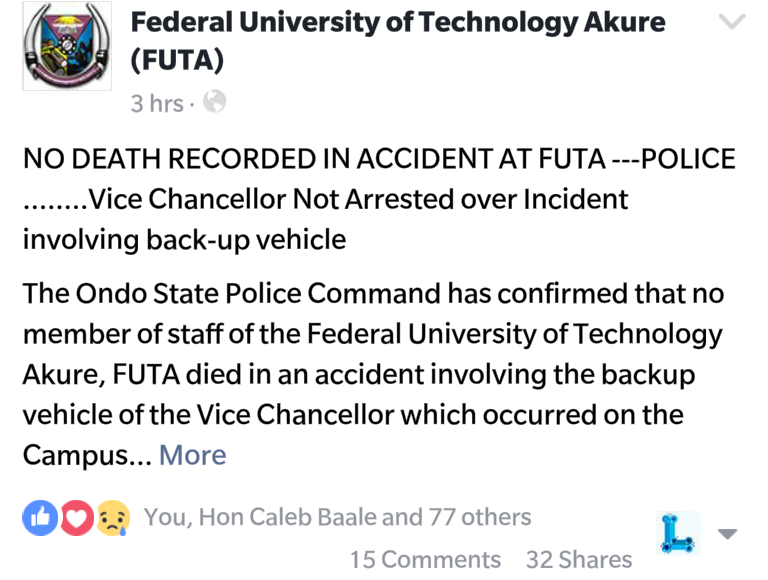 NO DEATH RECORDED IN ACCIDENT AT FUTA ---POLICE.Vice Chancellor Not Arrested over Incident involving back-up vehicle.The Ondo State Police Command has confirmed that no member of staff of the Federal University of Technology Akure, FUTA died in an accident involving the backup vehicle of the ViceChancellor which occurred on the Campus of the University on Monday November 28, 2016. The Ondo State Police Public Relations Officer, Mr. Femi Joseph made the clarification whilespeaking to newsmen. “The Case in FUTA is that of an accident and no death was recorded. The Victim of the accident was taken to the hospital and he is recuperating. There is no record of death,” Mr. Joseph Stated. In another development the Management of the University has also confirmed that the Vice Chancellor, Professor Adebiyi Daramola, contrary to reports making the rounds, was notarrested over the accident involving his back up vehicle driven by one of the University’s drivers. Prof. Adebiyi Daramola, the embattled Vice Chancellor of the crisis-ridden Federal University of Technology Akure (FUTA), in Ondo State, was this morning arrested after he hit a member of staff of the institution with his car.Abiodun Ademola Atunbi of the Non-Academic Staff Union (NASU) member of FUTA was allegedly crushed to the point of death, and was rushed to the hospital. SaharaReporters learned that the incident happened on the main campus at Oba’nla in Akure at about 8:30a.m. as some members of staff of the institution were gathering at a meeting point for prayers.Our correspondent gathered that the victim is the younger brother of a renowned journalist, Dele Atunbi of the Nigeria Television Authority (NTA). Police Officers from the Okuta Elerinla Police Station arrested Prof. Daramola shortly after the incident.Several aggrieved members of staff of the school converged at the Senate building following the incident. Many of them trooped out to the street and made a bonfire as a sign of protest against the Vice-Chancellor’s wickedness, described by one of them as a deliberate action taken out of anger to kill Mr. Atunbi, who was one of the activists agitating for his removal from office.One source told SaharaReporters that Mr. Atunbi was on his way to the prayer ground but was attacked by Professor Daramola with his vehicle immediately the Vice Chancellor saw him. “The Vice Chancellor deliberately did it with the aim of killing Mr. Atunbi who he sees as a threat and whistleblower to his corrupt administration in the school,” he said. “This is a man that has been threatening to kill all of us who are agitating for his removal from the office following the discovery of his corrupt practices with the school treasury.”Comrade Durojaiye, the FUTA Chairman of Senior Staff Association of Nigeria Universities (SSANU) also confirmed the incident to SaharaReporters in a telephone interview. “The incident happened around the bank road of the main campus, and I think it was deliberate because the Vice Chancellor has always threatened to deal with some of us who are against the continuity of his administration in the school. “The victim, Mr. Atunbi, is a member of NASU and is our time-keeper during this period of protest and he rings the bells early in the morning to create awareness for members of staff to converge at our meeting point for prayers. “Considering the incident that happened this morning, the aim of the VC is to kill us one after the other and keep us quiet but we have uncovered his plan, and he shall fail,” Mr. Durojaiye said.